The gunman, Francisco Amante, 51, described as a Spanish minstrel who has been Lummis’ houseguest for two years, surrendered to police, but no charges were filed. Lummis told police that he had known Procopio Montoya since the victim was a 2-year-old growing up in Isleta, N.M., and that he brought Montoya to Los Angeles about a year ago to work as a gardener and servant. Although Montoya was extremely devoted to his employer, he refused to obey orders from anyone else, Lummis said. According to Lummis, Amante had planted a garden and on the morning of the killing, went out to water it with a hose. Montoya, who had already done the day’s watering, yelled: “What are you doing with that hose?” and hit Amante with a large rock. Amante ran to his room, chased by Montoya, who was carrying another large rock. Amante got a pistol and shot Montoya in the groin. 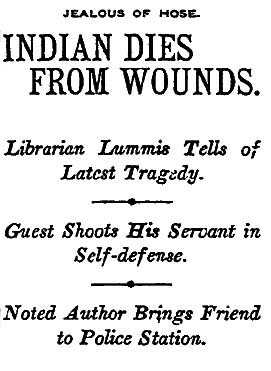 Lummis called a doctor after unloading Amante’s pistol, saying that Montoya did not appear to be badly wounded. “Amante went to see him and the lad asked the Spaniard’s pardon for having struck him with the stone. Then he embraced the old man. Just about 6 o’clock, he died,” The Times said. The coroner’s jury returned a verdict of self-defense.